Sunday night football brings us to Lambeau Field as NFC North rivals the Chicago Bears, take on the Green Bay Packers. Currently Green Bay is installed as a 9 point favorite with a total of 54. This game is airing on NBC and kick-off is scheduled for 8:30 PM EST. The Packers are fresh off their bye week. They were beat on Sunday night football in New Orleans despite the fact that QB Aaron Rodgers threw for a season high 418 yards. With some rest, I am sure he is feeling as healthy as he can be in week 10 of NFL action after getting banged up against the Saints. 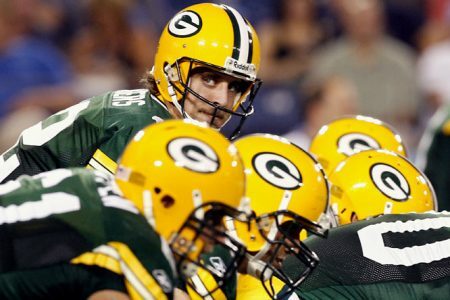 Green Bay has compiled a 11-3 SU and ATS record against the Bears with Aaron Rodgers behind center. Safe to say that they have had Chicago’s number lately. To add insult to injury, Jay Cutler sports a 1-9 SU and 2-8 ATS numbers against the Pack as a starter. So, with numbers like this in our corner, why are they even playing the game! This is why I will be taking the CHICAGO BEARS tonight. First, they are also off their bye week. They were totally dismantled in New England by Tom Brady and the Patriots. I know that they can’t really look worse than that. But more importantly for me, this game is going to come down to a couple players. Matt Forte. I think that he is the key to the Bears not only covering, but winning outright here. The Packers defense has been vulnerable against the run. Green Bay boasts the leagues worse run defense. That tells me something. That tells me even though they have Rodgers throwing TD passes (19) to Jordy Nelson (6) and Randall Cobb (9), the defense isn’t holding up their end of the bargain. Forte is clearly the best back on the field. Across the field, 2nd year RB Eddie Lacy has been anything but special. The guy has 3 games of more than 49 yards rushing. Just one 100 yard game. Tight End Martellus Bennett. Now he is a bit banged up with a rib injury, but I fully expect this guy to play. I have liked his game for years. When targeted, the guy makes plays. He is exactly what Cutler needs in the middle of the field to A. open things up for Forte in the run game, B. take an extra defender off talented WRs Jeffery and Marshall who haven’t had many explosive moments this season. I expect that to change here on Sunday night football. This is too many points for any team to give when their defense has problems stopping people. Look for the CHICAGO BEARS to not only control the clock with Forte, but to also challenge for an outright win here. I recommend a play on the CHICAGO BEARS and UNDER tonight in Lambeau!